Thursday 21st April -Australian Market Wrap | Beeks Downunder-Because not all financial news is boring! 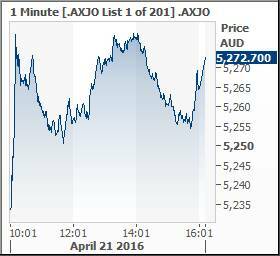 ASX 200 closes up 56.7 points at 5272.7 with resources again the driver. Volume was better at $5.59bn today. Asian markets mixed with Japan up 2.7% but China barely moving up 0.27%. 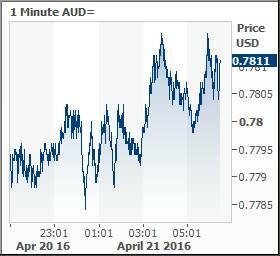 AUD 78.05 cents. US Futures up 32. Another strong day in resources has seen the index break convincingly above 5200 and close at 5272.7 to extend the range. Solid gains again in the resource sector drove the ASX 200 higher with banks finally moving higher on some clear air after the ASIC announcement yesterday. Strong gains in iron ore and oil are driving the big miners and energy plays higher and we are seeing some sector rotation out of sectors that have performed well in the last six months. REITS have been a prime example of that as they fell across the board today. We are close to the high of the year, which started at 5295 only to bottom in February at 4765. Energy stocks were superstars again. Woodside Petroleum (WPL) +5.87% the standout following the AGM comments from CEO Coleman and a positive outlook, with a focus on costs and adapting to a changing environment. 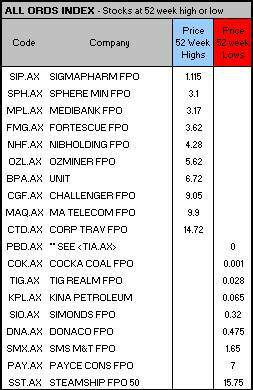 Santos (STO) +9.98%, Origin Energy (ORG) +8.82% and Caltex (CTX) +3.33%. Gold stocks seem to be running out of steam as the stronger AUD is hurting the bullion price and profit-taking seems to be happening across the sector as punters move into iron and oil. Gold Road (GOR) -5.83%, Newcrest (NCM)-1.782.98% with St Barbara (SBM) -0.07% and Perseus (PRU) -2.97%. Financials and banks outperformed with a gain of around 1.3-1.7%% for the big four as they appear to be falling into line on government action on the sector. 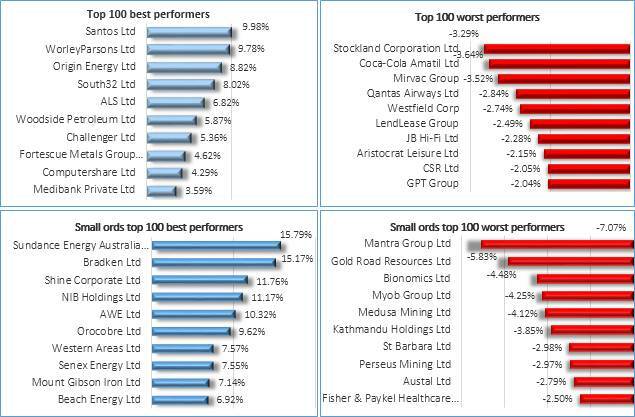 Australia and New Zealand Bank (ANZ) +1.67% the best performer out of the four, with insurers taking the NIB holdings (NHF) +11.17% upgrade as an excuse to push up. Medibank Private (MPL) +3.59%, IAG +1.93% and QBE Insurance +0.98%. 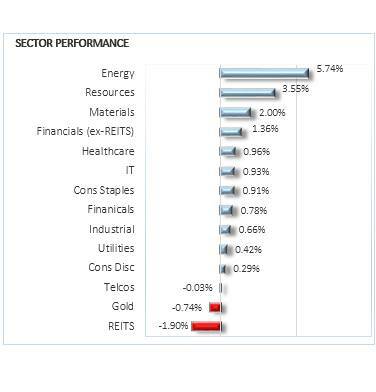 REITS though were sold off to rotate into more risky sectors. Scentre Group (SCG) -1.95%, Westfield Corp (WFD) -2.74% and Stockland (SGP) -3.64%. Industrials were mixed again with pockets of strength in Wesfarmers (WES) +2.78%, ALS Ltd (ALQ) +6.82% and healthcare stocks like Ramsay Healthcare (RHC) +2.63%, CSL +0.72%, Ansell (ANN) +3.24% and Healthscope (HSO) +1.85%. Speculative stock of the day: Exterra (EXC) +44.83% following the granting of a licence for its Lithium project called Moolyella in the Pilbara. The Australian Bankers’ Association this morning announced a review of conflicted payments to staff, including commissions for selling certain financial products. It said these payments would be scrapped or changed where it led to poor outcomes for customers. Banks say they will also work with regulators to “ensure the highest standards of whistle blower protections by ensuring there is a robust and trusted framework for escalating concerns”. It is understood that the ACCC has been approached by the banks, who want to ensure their proposal to work together does not fall foul of competition laws. South32 (S32) +8.02% has eliminated its debt and now has a positive cash position of $US18 million ($23.1 million), but it also revealed production fell across most of its key commodities in the March quarter. Production for the nine months to the end of March fell in aluminium (down 5%), energy coal (down 7%), metallurgical coal (down 10 %) and manganese ore (down 10%). Management also said South32 would deliver on its promised $US300m of cost cuts for the FY. Ten Network (TEN) -0.5% reported NPAT of $13.4m in the first half, up from a loss of $264.4m in the pcp following a one off writedown of its licence. Revenue improved 8.1% to $348.5m. Wesfarmers (WES) +2.78% announced same store sales in Coles rose 4.4% in line with expectations. Total food and liquor sales rose 5.9% to $7.5bn with Bunnings recording an 8.3% rise compared with 9.4% previously. Wesfarmers has also announced a major clearance of Target stores and a rebranding of some to Kmart under new chief Guy Russo. Loss making or underperforming Target stores will convert to Kmart enabling more coordination and efficiencies. All is not well in the state of Woodside (WPL) +5.87%, with the board and management wrapped over the knuckles at today’s AGM for its remuneration policies. 27% of votes cast voted against the remuneration which constitutes a ‘first strike’. It seems there is some anger on the pay of CEO Peter Coleman and his pay of $7.5m, with the majority of this ‘performance related‘. This is following an aborted tilt at Oil Search together with huge writedowns on it Wheatstone LNG project, together with a 30% share price fall. NIB Health Insurance (NHF) +11.17% has lifted its profit guidance to between $113-$121m, up from its previous guidance of $90-$100m. The lift is due to a continuation of lower than expected claims. 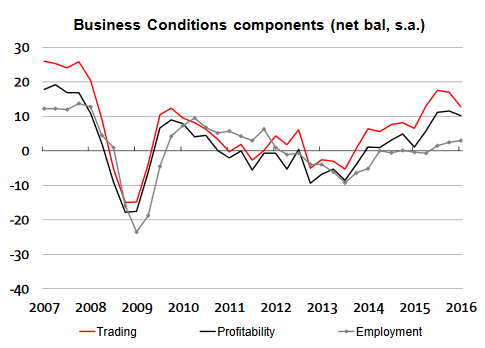 Business confidence remained largely positive according to the NAB quarterly business survey. Conditions and confidence have eased modestly down 1 point to 9 and 5 respectively. Yet it appears both picked up a little late in the quarter. A Deloitte survey today revealed that two-thirds of home borrowing was covered by at least one month’s worth of repayments. 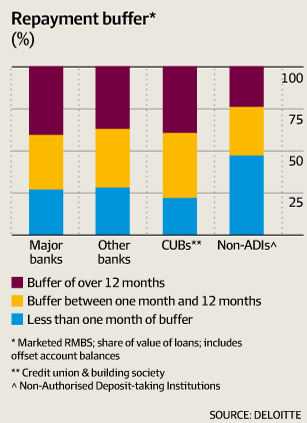 A third of loans had a buffer of 12 months. This is a positive for the much maligned banking sector given the concerns of a housing bubble and bad debts that would flow through. 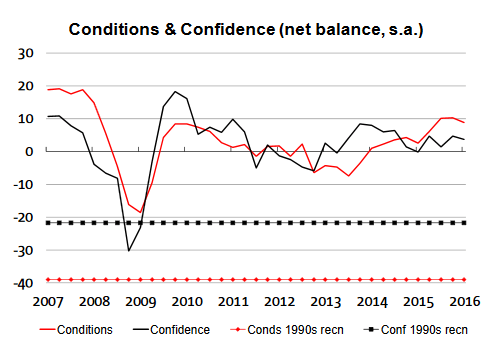 The report noted that the debt to income ratio for Australians has deteriorated, from around 125% in 2000 to more than 180% in 2016 but that this is against a backdrop of interest rates being substantially lower, with the debt burden being disproportionately shared by higher income households who are more able to service debt. Steel Rebar futures jumped for the fourth straight day on Shanghai Futures Exchange, advancing as much as 6.3% to 2,755 yuan ($425) a metric ton. The product that’s used to strengthen concrete is 19% higher this week, and up 53% in 2016. Seems that demand for steel is improving as stimulus appears to be working. Some analysts predict that steel demand in China may increase 10% this year. News that Mitsubishi had manipulated its fuel economy tests could put the company in need of a handout from its parent to remain viable. 625,000 minicars produced over the past three years, three-quarters of which it supplied to Nissan, were marketed as being as much as 10% more fuel efficient than they were by understating how much air and tyre resistance they encounter out on the road. In China, authorities have suspended new registrations of finance companies nationwide as they started a crackdown on Internet finance. Firms will need approvals from financial regulators now. Yum! Brands has released positive numbers based on a Chicken Bucket deal that was heavily promoted over the Lunar New Year. The company reported an 8% increase in profit to US$391m for the first three months of 2016. Tonight we get word from Super Mario Draghi. 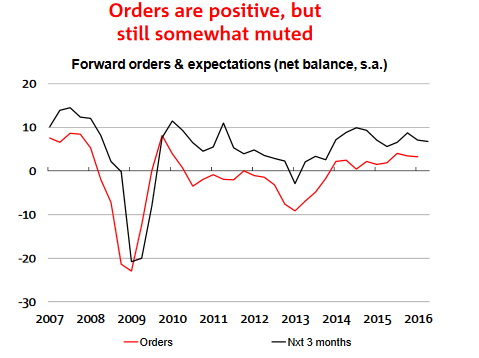 Draghi and the Council are not expected to make any major policy changes when they meet but will instead wheel out some “verbal QE” rhetoric aimed in part at weakening the trade-weighted euro (now back to levels last seen in early 2015). News from the world of hedge funds as they suffer their biggest loss of funds in 7 years as investors revolt over the ‘exorbitant fees’. Potential disruption to the oil market, with news of a fatal explosion in a Mexican oil plant having been denied by the operating company. The Canadian government will introduce legislation next year that would make the sale of marijuana legal. If enacted, the move would make Canada one of the largest Western countries to allow widespread use of the drug.